Just as we often tend to worry about our own health, and what foods we should and shouldn’t be putting in our bodies, it is completely normal to wonder what is and is not okay for our dogs to eat. It’s important to remember that dogs digestive systems are completely different than yours or mine and although it may seem logical that if a certain food is healthy for you, then it must be good for your dog too, but this isn’t usually the case. Whether it’s fruits and veggies, or your favorite pair of shoes, many dogs will devour pretty much anything they can get their paws on and unfortunately, there is a lot of confusion, and more than a few rumors, about what is and is not okay for dogs to eat. 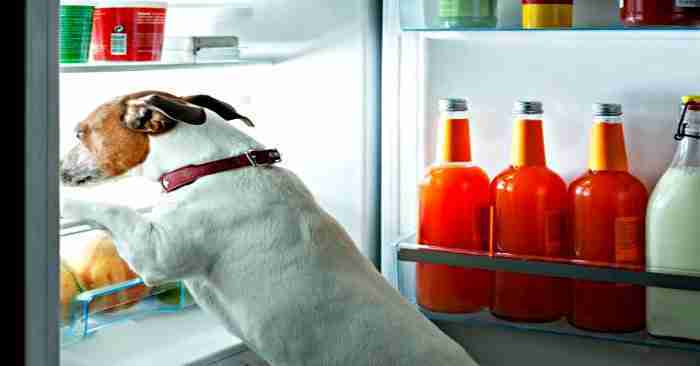 In fact, many people are unaware of the dangers of foods that are toxic for dogs. Because bananas are a great source of nutrients, such as potassium, fiber, manganese, Vitamin B6, Vitamin C, biotin and copper, they canÂ make wonderful treats. However, due to their high sugar content, you should only feed your dog bananas in moderation.Â A daily snack of between one and two inches of banana is usually fine for most medium and large-sized dogs. Also, as with any new addition to your dog’s diet, be sure to keep a close eye on your dog after feeding them bananas for the first time, so you can screen for any potential allergies or other adverse reactions, such as constipation. From practical experience, some dogs love bananas and some hate bananas, says Cathy Alinovi, DVM. As long as bananas are just a snack, not the whole meal, and the dog isn’t allergic to the banana, then there’s no reason not to feed them. Short answer: Yes, in moderation. It’s true, most dogs go CRAZY for cheese. Cheese is extremely rich in calcium and can play an important role in your dog’s bone formation, muscle contractions and other bodily functions. Many cheeses also contain vitamin D, protein and essential fatty acids. The primary concern with giving your dog cheese is whether or not he/she is lactose intolerant. Gas, bloating and diarrhea are the most common symptoms of lactose intolerance in dogs. If you choose to give your dog cheese, do so in moderation, primarily because of the high fat content. Pro tip: A small piece of cheese is a great way to conceal your dog’s medication. Not only are blueberries a safe superfood for your four-legged friend, they’re also loaded with vitamins, antioxidants and fiber. Small amounts of blueberries can help control your dog’s blood-sugar levels and can even improve cardiovascular health. Additionally, blueberries may be especially beneficial for older dogs, as studies have shown the berries potential to help with cognitive functions. Veterinarian Cathy Alinovi says: “Blueberries do the same for dogs as they do for humans: great antioxidants, fun treats, provide fun snacks to share with the furry family”. Pro tip: Freeze some blueberries to make a crunchy treat that dogs LOVE! In moderation, popcorn can be an extremely healthy snack for both you and your pup. However, the issue lies in how the popcorn is prepared, seasoned, or otherwise flavored. Air-popped corn is a natural treat that contains a ton of fiber as well as small amounts of riboflavin, B-vitamins and thiamine. It is a healthy treat that can help aid digestiion and maintain energy levels. Popcorn that’s cooked in oil, covered in salt or soaked with butter on the other hand, is typically saturated in chemicals and other additives which negate any and all of the would-be benefits of the treat. Also, microwaved popcorn is terrible for both you and your dog. Most microwave popcorn contains anywhere between 150-300 mg of sodium per serving. Did you know: Popcorn was grown and eaten by people from Peru to Mexico for thousands of years before the arrival of European colonists? Short answer: Of course! Strawberries can be very healthy for dogs when given in moderation. Strawberries are a wonderful source of vitamins, minerals and other beneficial nutrients. Fiber, potassium, magnesium, iodine, folic acid and omega-3 fats can all be found in the lush, red berries. Many dogs go tail-wagging crazy for sweet foods like strawberries but keep in mind, they are very high in natural sugar, and just like in humans, too much sugar can lead to trouble. Although it can be difficult to say no to those sad, pleading brown eyes, you should do your best to keep the sweet snacks to a minimum. We are often asked, “are grapes bad for dogs?”. The truth is that grapes, raisins and currants can be extremely toxic for dogs and you should never allow yours to eat them. Veterinarians aren’t quite sure why grapes are poisonous to dogs, but even as little as one grape per pound of body weight can be enough to cause serious medical conditions, such as kidney failure which can be fatal. If your dog gets into the grapes, raisins or currants, call your veterinarian immediately! Broccoli is an extremely healthy food that’s packed with fiber, vitamins and nutrients. However, if you choose to give your dog broccoli, you should only do so in moderation because your dog’s digestive system is a tad bit more sensitive than yours or mine. Broccoli contains an ingredient called Isothiocyanate which can be a gastric irritant, but the chemical is typically only a cause for concern in large amounts. Pro tip: Try giving your dog lightly-steamed broccoli. It’s a treat most dogs LOVE. Short answer: Yes, eggs are an amazing source of protein for your dog. Eggs can help strengthen hair, build muscle and repair damaged tissue. Although there is much debate over whether or not raw eggs are safe for dogs, simply hard-boiling them beforehand can ease any concerns about Salmonella poisoning. Did you know: According to PetMD, there is strong evidence to support that eggshells are a wonderful source of protein and calcium for your dog. Pro tip: Crush an eggshell and place 1/2 a teaspoon in their food every day to help support strong bones and teeth. Short answer: No, almonds may pose potential health problems for dogs. Although almonds are not typically toxic to dogs, they do pose other potential hazards. Because almonds are very high in fats, they can cause inflammation of your dog’s pancreas. Signs to look for are vomiting, diarrhea, loss of appetite and lethargy. Other problems dogs have with almonds include the possibility of choking or gastrointestinal obstruction due to the nuts shape, water-retention due to salted nuts, or possibly an allergic reaction. Did you know: Nut allergies are just as common in dogs as in humans? Because apples contain Vitamins C and K, calcium, pectin, fiber and phosphorous, they can be an incredibly healthy treat for your dog. Apples can also be an effective means of quelling a pooch with an insatiable sweet-tooth. The only cause for concern when it comes to feeding your dog apples is the core and seeds. Apple cores can pose a potential choking hazard and apple seeds contain cyanide. Too many seeds could, over time, cause a buildup of this toxic chemical and thus harm your pet. Again, they key is moderation. Two great ways to serve your dog apples are to cut them into slices and freeze them or grate them and serve the apples with your dog’s dinner. Most dogs can safely eat watermelon without any negative side-effects. This summertime favorite makes for a very healthy snack, as it doesn’t contain any fat or cholesterol and consists of 91% water. Watermelon is loaded with minerals, such as beta-carotene, magnesium, potassium and Vitamins A and C, and it can help hydrate your dog on a hot summer day. One thing to be mindful of when feeding your dog watermelon however, is that it can potentially cause diarrhea. Start out slowly by only giving your dog a few small pieces and watch how it affects him or her before giving more. Thankfully, oranges are one of the foods that are equally as safe and healthy for dogs as they are for you! Because oranges are extremely rich in vitamin C, they can be very beneficial for your dog’s immune system. Be mindful however, that oranges are very acidic and that too many can cause diarrhea. Carrots are a great choice for a healthy snack because they’re loaded with fiber, antioxidants and a high concentration of beta-carotene. These vitamins and minerals can help maintain healthy skin and coat, and also aid in digestion. Also, many dogs love crunching on raw carrots, and doing so can help keep your dog’s teeth strong, polished, and clean. For older dogs or those with sensitive teeth or bowels, you can also cook and/or puree carrots for a healthy treat that is easy to digest. Pro tip: Frozen carrots make great chew toys/snacks for teething puppies. Short answer: It’s your choice. Although many dogs can stomach small amounts of avocado, the fruit, seeds, leaves and bark contain a chemical called persin, which many say is toxic to dogs. The biggest cause for concern however, is the seed, which due to its size alone, can pose a choking hazard or could possibly obstruct your dog’s digestive system. If your dog eats avocados, look for signs of distress, such as vomiting, diarrhea or lack of stool production, and if you notice any of these symptoms, contact a veterinarian immediately. Typically, small amounts of avocado will only lead to an upset stomach, at worst, and many argue that avocados are not poisonous to dogs or cats. However, due to its possible toxicity, we recommend that you do more research on the matter before choosing to feed your dog avocados. Remember: It’s better to be safe, than sorry. Can Dogs Eat Onions or Garlic? You should never, under any circumstances feed your dog onions, garlic, leeks or chives. These foods contain an ingredient called “Thiosulphate” which is extremely toxic to dogs. The sulfurs found in onions and garlic negatively affect dogs red blood cells by causing the cells to explode. This condition is called canine Heinz Body Anemia and you can find out more about it here. Even trace amounts of onions or garlic can be toxic to dogs. Warning: Many homemade dog treat recipes call for onion or garlic powder, and many other foods, such as potato chips may contain them too. Due to having a higher concentration, the powdered forms are especially dangerous. Much debate exists over whether or not tomatoes are safe for dogs to eat. Our general consensus is that small amounts of fully ripened, red tomatoes are generally okay, but are not recommended. Tomato plants belong to the nightshade family, and the plants contain Alpha-Tomatine and Solanine. These chemicals make any part of the plant extremely dangerous for dogs, but the harmful substance is most potent in the plant’s leaves, stems and unripened fruit. Symptoms of poisoning from tomatoes include vomiting, dilated pupils, muscle weakness, difficulty breathing, drooling and lack of coordination. Potatoes belong to the nightshade family of plants, and they contain Solanine and other toxic alkaloids. If these are eaten in large enough doses, they can cause severe gastrointestinal upset, vomiting, diarrhea, loss of appetite, confusion, behavioral changes and can depress your dog’s central nervous system. It is likely that very small amounts of fully-ripened potatoes will not harm your dog. However, unripened potatoes and plant material are especially toxic, and should be avoided at all costs. If you choose to feed your dog potatoes, it is important to ensure that they are handled properly and fully cooked. Warning: Be extremely cautious about feeding your dog potato chips because many brands contain onion or garlic powder which is extremely toxic to dogs. Unlike normal potatoes, which you should avoid feeding your dog, sweet potatoes can be a very healthy addition to your dog’s diet. Sweet potatoes contain large amounts of Vitamin C, Vitamin B6, beta-carotene and manganese, and they are a great source of dietary fiber. Feeding your dog sweet potatoes is a wonderful way to help boost your four-legged friend’s immune and digestive systems. As with many other foods however, moderation is key. Sweet potatoes are very high in both sugar and carbohydrates. Feeding your dog too many can lead to adverse symptoms ranging anywhere from an upset stomach and diarrhea to obesity. The Biggest Take-Away: Most of the time, human food is best left out of your dog’s food bowl. Remember, the signs of food toxicity in dogs are not always apparent. Some people may argue that their dog has eaten some of the foods on this list marked â€œnoâ€ and that their animal is fine. However, many of the adverse effects of these foods are not always obvious or immediate, and it is always better to err on the side of caution. If you’re unsure about a certain food, don’t give it to your dog and if you think your pet has consumed something that he or she shouldn’t have, contact a veterinarian immediately. Most instances of food poisoning due to these foods can be treated, but it’s extremely important to seek a trained medical professional’s opinion upon your earliest suspicion of poisoning because when it comes to food toxicity, time is of the essence. Always keep the phone number and address of your preferred veterinarian handy, in case of an emergency and it’s also a great idea to save the contact information for a local emergency veterinarian or animal hospital, in case your pet’s primary vet isn’t available. this article together. I once again find myself personally spending way too much time both reading and posting comments. We’re glad you found this read to be worth your time. Be sure to check out our other blogs. We love spending time writing them for you to read and learn. Yes, this comprehensive blog will definitely help save your dog and help you make a healthy food decision for your dog!